I packed my bags for a 3 week trip out the country. First stop —> Australia. Australia had been on the top of my bucket list for a long time. One of my closest friends moved to Sydney for a few months for work, and I thought it was the perfect opportunity to visit. She finished her 3-month job when I came to visit, and from Sydney we both traveled to Bali together. I only stayed in Australia for 5 days, which wasn’t enough time, but had a great experience nonetheless. It is such a huge continent with so much beauty and places to see. I definitely want to go back and spend more time and visit other cities. I stayed in Sydney but flew to Cairns for a night to snorkel the Great Barrier Reef for a day which was an experience of a lifetime and I highly recommend it. My friend and I took a private helicopter ride over the reef and landed on a small platform in the middle of the ocean to snorkel off a boat. The helicopter ride was one of the most breathtaking moments of my life. Seeing the Great Barrier Reef from above is truly incredible. I am obsessed with underwater life and love the ocean. I swear I was a mermaid in my past life. I’ve snorkeled all over the world and I have never seen coral and colors like I did there. It almost looked fake. I kept thinking that the coral looked spray painted because of how vibrant the colors were. I’m so glad I decided to make the trip to Cairns to see the reef- it was the highlight of my trip. Sydney is an amazing city. It’s right on the water and Sydney Harbour is absolutely beautiful. My friend performed every night at the Opera House, so I got to see her show there which was really cool. I had four full days in Sydney so I had enough time to get a good feel of the city. The main places I visited in were Sydney Harbour and the Opera House, Circular Quay, The Rocks, Royal Botanical Gardens, Bondi Beach, Icebergs at Bondi, Bondi to Bronte Coastal Walk, Manly Beach, Shelly Beach, and Balmoral Beach. I was recommended to do the Sydney Harbour Bridge climb, but didn’t get the chance to do it. There is so much to do and see, and the beaches around Sydney are all beautiful. I didn’t have time to see them all but I hit the main ones. 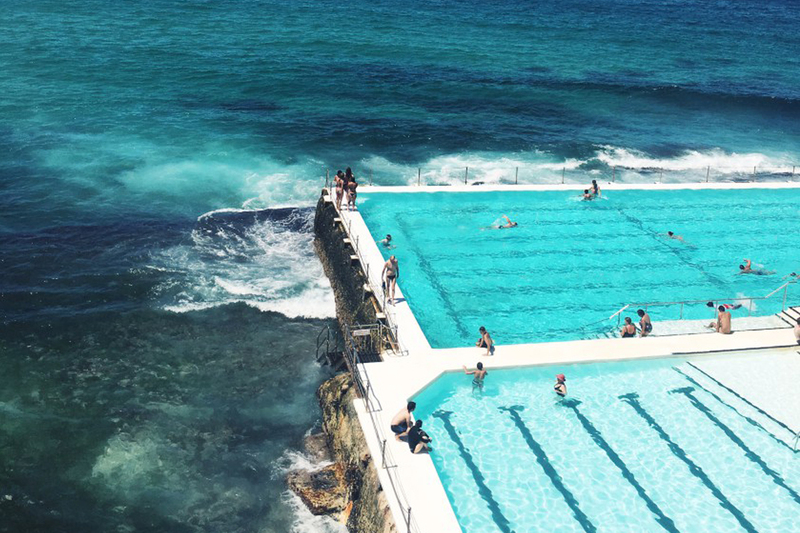 Bondi Beach and Icebergs is obviously a must. Check out my video and my picture highlights of my trip. Hope you like! What’s the name of the pool by the ocean?